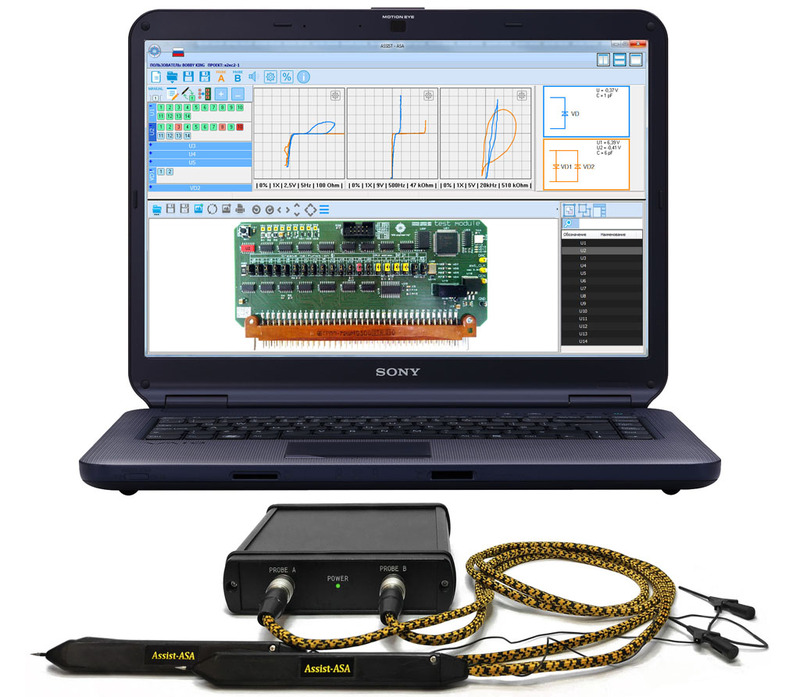 Curve tracer of voltmeter and impedance signatures Assist-ASA is a hardware-software complex designed for technical diagnosis and troubleshooting in electronic digital, digital-to-analogue and analogue circuits, modules and units using parametric method. Assist-ASA has the possibility of troubleshooting (of microchips, transistors, capacitors, resistors etc.) on the board of unit under testing (here and after – UUT) without supplying it with feeding voltage. Curve tracer can be used by staff without high qualification. It also provide conditions to make a repair of electronic modules quickly even if basic circuit diagrams are absent or not found. Troubleshooting of UUT is performed with parametric method VI (UI, ASA) by measuring volt-ampere signatures and impedance characteristic in the check points of the malfunctioning electronic module and then compare data to the reference points. Reference characteristics are measure on known-good circuit and are stored in files in PC. There is also a possibility to work without storing the reference data (using and applying the second probe in the same point on known-good board). Assist-ASA operates with the characteristics presented in the form of graphical signatures and their corresponding numerical values (R is resistance, C is capacitance, U is voltage at the inflection point of the current-voltage characteristic). The criterion for the discrepancy of characteristics during automatic comparison is the excess of the threshold of tolerance of the measured R, C, U from the reference one. The threshold is set programmatically in percentage terms. For most cases, it is recommended to set the value of the limit deviation threshold at the level of 10–15%. The method allows you to get information in order to determine the faulty elements on the board as well as to find breaks and short circuits of the conductors of the printed circuit board. The Assist-ASA consists of an analysis unit and two active probes (each of them is equipped with a contact needle and a micro-circuit). The USB analysis unit is connected to a control computer (laptop) with special software installed. Assist-ASA can be equipped with optional accessories.